TAMPA, Fla. (AP) — Tyler Johnson scored a pair of third-period goals Friday night, helping the Tampa Bay Lightning beat the Detroit Red Wings 5-2 in Game 2 of their first-round playoff series. Ben Bishop had 30 saves for the defending Eastern Conference champions, who took the first two games at home despite playing without injured leading goal scorer Steven Stamkos and defenseman Anton Stralman. A bloody brawl involving several players capped this one, with 14 penalties called — including a game misconduct on Justin Abdelkader — with 54 seconds left. 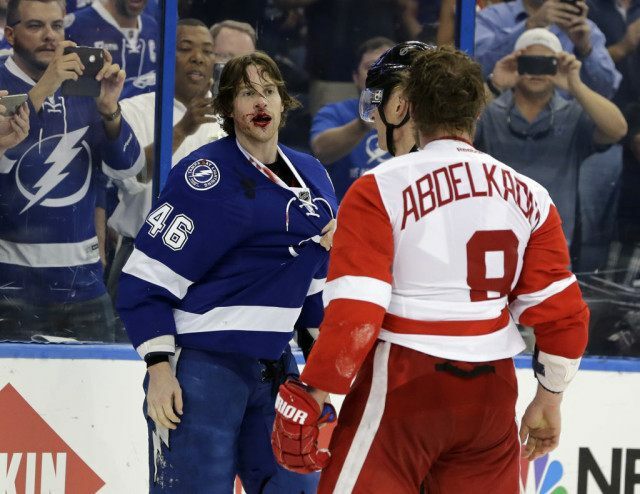 Tampa Bay’s Mike Blunden was left with his face bloodied after fighting with Abdelkader. Game 3 is Sunday in Detroit, where the Red Wings won both regular-season meetings between the teams. Johnson put Tampa Bay ahead for good barely two minutes after Detroit’s Brad Richards made it 2-2 with a power-play goal. Nikita Kucherov and Brian Boyle also scored for the Lightning, who tacked on Alex Killorn’s empty-netter with 2:14 remaining. Johnson also had two assists, the first on Kucherov’s 5-on-3 power-play goal. Kucherov and Killorn had the primary assists on Johnson’s goals, and Jonathan Drouin got his first career playoff point, setting up Boyle to give Tampa Bay a 2-1 lead. Rookie Dylan Larkin scored a first-period goal for Detroit, which outshot the Lightning (32-31) for the second straight game. The line of Johnson, Kucherov and Killorn had three goals and three assists for Tampa Bay in Game 1, with Killorn scoring the winner to finish a comeback from a 2-1 deficit. Kucherov’s third goal of the series, on a shot from the right circle that skipped over Howard’s left shoulder, got the Lightning off to another strong start. Victor Hedman and Johnson assisted after Kucherov hit the crossbar from the left circle with Red Wings Gustav Nyquist (slashing) and Abdelkader (tripping) in the penalty box. Larkin’s first career goal made it 1-1 at 3:30 of the second period, but the Red Wings failed to take advantage of three power-play opportunities and entered the final period trailing by a goal after Boyle scored from the slot off a pass from Drouin, who has played a bigger than expected role for the Lightning since being recalled from the minors on April 7. The 21-year-old Drouin has gone from being benched, demanding a trade and eventually being sent to the minors, where he also served a suspension for refusing to play for Syracuse of the AHL. He scored in his first two games after being recalled and had more than 18 minutes of ice time — second among Tampa Bay forwards — in Game 1 on Wednesday night. Detroit pulled even again, with Richards scoring on the team’s fifth power-play opportunity of the night. The Red Wings were 0 for 8 in the series before that goal. NOTES: Bishop, who led the NHL in goals-against average and was second in save percentage, set the tone early for the Lightning, stopping 15 shots in the opening period. … Larkin went from not being sure he’d be on Detroit’s roster in the preseason to scoring a team-high 23 goals and tying for third on the team with 45 points. … This is only the third time in 18 series that Tampa Bay has taken a 2-0 lead.